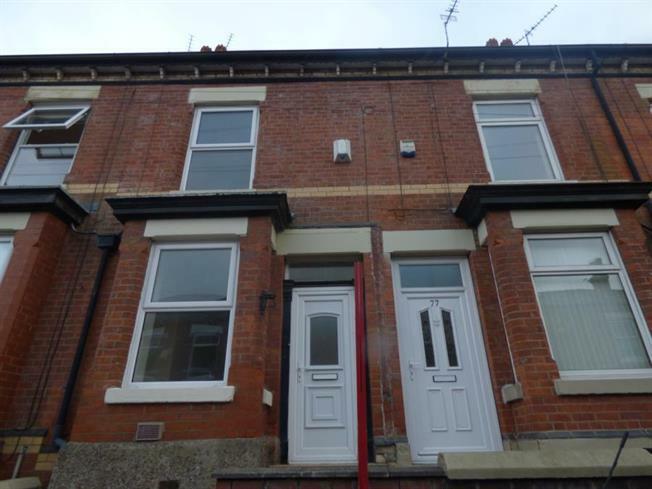 2 Bedroom Terraced House For Sale in Hyde for Offers Over £100,000. This property's price has dropped from £105,000 to Offers Over £100,000. Recently renovated two bedroom terraced property comprising of a large lounge featuring a bay window at the front of the house. Leading on from the lounge is a good sized dining room and a modern kitchen extension at the rear. Upstairs there is a large master bedroom and a good sized second bedroom with a family bathroom in between. Outside there is a small paved over yard at the rear of the property. UPVC front double glazed door. Carpeted flooring. UPVC back double glazed door. Double glazed uPVC window. Tiled flooring, part tiled walls, ceiling light. Granite effect work surface, fitted units, stainless steel sink, integrated oven, gas hob, over hob extractor, space for dishwasher. Heated towel rail, tiled flooring, ceiling light. Low level WC, panelled bath, shower over bath, pedestal sink, extractor fan.